Although we have created basic app in angularJS and know about AngularJS MVC which has all the controls of a model view controller architecture. Our app isn’t very practical yet(talking about previous tutorials), because all the code is in same page (look at tutorial 3: AngularJS MVC) that is a problem because later on when you will deal with large application you cannot use this approach. So better way is to organize your code into angularJS modules. 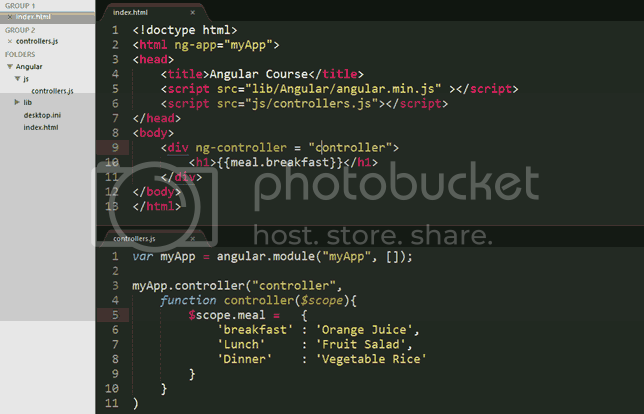 Remember module is not just AngularJS concept but it is regular JS concept. Modules are way of organizing your code which means you split up work or functionality between different sections of your code. You can think of a module as a container for the different parts of your app – controllers, services, filters, directives, etc. Your code now must look like this in controllers.js. var myApp is just a variable. Angular.module shows it is a module and then “myApp” shows the name of module after comma there is an empty array which is not yet holding anything but later on we shall look into that basically it holds services, routes information etc but we are not using such service or module here so empty array is alrite for now. ‘var myApp’ is a namespace(think of it as a general container) which is expecting a controller. In parenthesis, name of the controller is given which is same as function name controller to which it is pointing (make sure function name must be same in controller as well as in this namespace line in inverted commas ). Notice that there is a comma which is used to separate controller name known to module from actual controller. Next at the end of code after CONTROLLER+MODEL just add a closing parenthesis so that module ends.